On the 18th (Mon), take some stellar pictures from Cathedrale de St-Pierre and then ponder the design of The Geneva Water Fountain. To see where to stay, photos, more things to do, and tourist information, go to the Geneva online travel planner . London, UK to Geneva is an approximately 4.5-hour flight. You can also take a train; or do a combination of flight, tram, and train. The time zone difference moving from Greenwich Mean Time (GMT) to Central European Time (CET) is 1 hour. Expect a daytime high around 7°C in February, and nighttime lows around 0°C. Cap off your sightseeing on the 19th (Tue) early enough to catch the train to Zermatt. 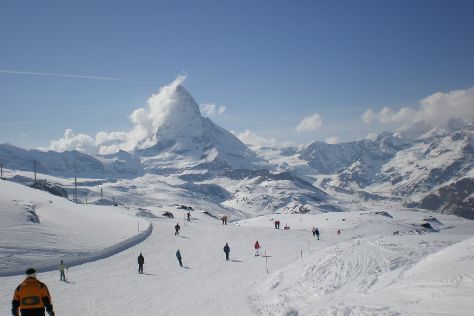 Kick off your visit on the 20th (Wed): don't miss a visit to Photopoint Kirchbrucke bridge, hit the slopes at Matterhorn Ski Paradise, and then get great views at Gornergrat. To find other places to visit, maps, reviews, and more tourist information, refer to the Zermatt itinerary builder . Getting from Geneva to Zermatt by train takes about 4 hours. Wrap up your sightseeing on the 20th (Wed) to allow time to take a train to Zurich. 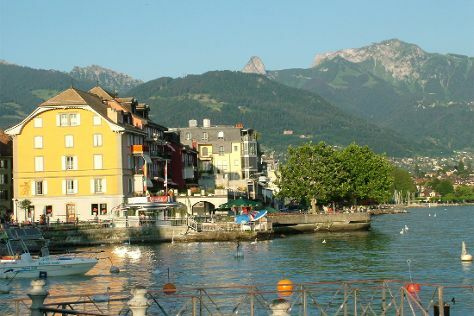 Explore Zurich's surroundings by going to Lucerne (Lake Lucerne, Chapel Bridge, & more). Next up on the itinerary: take an in-depth tour of Swiss National Museum, take a stroll through Old Town (Altstadt), take in the architecture and atmosphere at Grossmunster, and see the interesting displays at Augusto Giacometti. For reviews, other places to visit, traveler tips, and more tourist information, refer to the Zurich tour planner. Traveling by train from Zermatt to Zurich takes 4 hours. Alternatively, you can do a combination of train and bus. In February, daytime highs in Zurich are 7°C, while nighttime lows are -1°C. Finish up your sightseeing early on the 23rd (Sat) so you can travel back home.